Cordial is an adaptive messaging platform powered by machine learning—built to empower marketers. This is a solution that doesn’t hold you back. Doesn’t hold back. It’s an adaptive messaging platform powered by machine learning that constantly seeks inputs from your customers, wherever they are—and turns those inputs into conversations, in the very moment they happen. 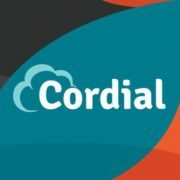 Because Cordial was built by a group of marketers who felt limited by what was out there, so they built a new platform to be different, and better.